Dried squash sits in a traditional basket woven by a Tohono O’odham basketry artist. The longer I work at a tribal college, the more I feel it’s crucial for those of us teaching science to indigenous students to open our minds to views that stretch beyond the boundaries of western science. Many Native peoples accept a spiritual dimension that goes quite beyond the material perspective encouraged by the conventional scientific view. That’s something that’s been brought home to me during my three years as a science and agriculture instructor for Tohono O’odham Community College in southwestern Arizona. For instance, I’ve learned how the oft-quoted phrase “All My Relations” expresses a connection with not only distant relatives and humankind as a whole —which was my previous understanding—but even to the plant family. In this context, the corn, beans and squash sometimes called “the Three Sisters” attain a status that goes well beyond sustenance. This understanding, in turn, produces a reverent attitude toward seeds that contrasts with the western approach. Western science appears to view tampering with the genetic material of seeds as a sign of progress with no ominous overtones. Almost weekly I come across another newspaper article that discusses the gene splicing CRISPR technology as an “editing” process. Often neither the writer nor the scientists quoted even acknowledge concerns about altering genes and, by extension, life as we know it. Indigenous thinkers might consider gene “editing” more suitable for the fictional Dr. Frankenstein than for modern scientists. And to such thinkers, the concept of patenting seeds—which the companies that genetically tamper with seeds often do—must make about as much sense as patenting life. Those are some of the thoughts that came to mind about a year ago after I attended a Southwest Indigenous Foodways Gathering in Ajo, Arizona. Members from a variety of tribes gathered for the conference. Many of them implied or outright stated that each natural variety of seed deserves respect for its inherent essence. Although they did not invoke the word “soul,” I gleaned from several wise women in attendance that manipulation in the wrong hands could harm the seed at a deeper, even spiritual, level. For instance, Ramona Button, founder and owner of Ramona’s American Indian Foods, said she considers the tepary bean seeds she grows as entrusted to her care. Her farm resides on the Gila River Indian Reservation, which serves the Pee Posh tribe as well as the Akimel O’odham, considered a sister tribe to the Tohono O’odham I serve at TOCC. 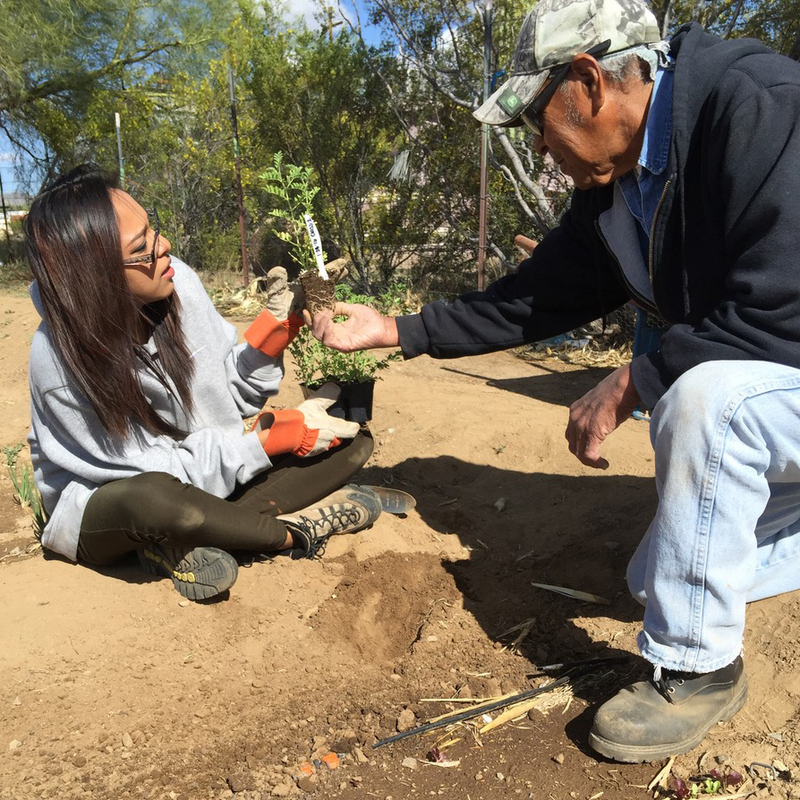 Clifford Pablo, a longtime Tohono O’odham farmer whose job includes managing the Student Learning Farm, hands a seedling to student Myriah Cypriano for transplanting. Tepary beans, a traditional food known as bawi to the O’odham, are perhaps the most drought-tolerant legume in the world. In this time of climate change, with hotter and drier weather becoming the norm, these drought-hardy beans are attracting interest from near and far. But Button won’t hand off these bawi in vast piles to strangers, she said—not at any price. She doesn’t want the seeds in her care getting into the hands of people who might tinker with the genetic coding of this ancient seed. She’s one of many people who would consider genetic tampering to be far worse than a mere “editing” job. Others at the conference expressed similar sentiments, most notably Rowen White of the Indigenous SeedKeepers Network of the Native American Food Sovereignty Alliance (NAFSA). As a member of the Kanien’kehá:ka tribe affiliated with the Haudenosaunee (also known as a Mohawk member of the Iroquois Confederacy), she told dozens of us at her seed workshop that she feels a kinship to the seeds that goes beyond an ability to describe with English words. Both the seed and the human agreed to give up a little bit of their wildness in creating the bond of kinship, she explained. They now share a responsibility to help each other out and keep each other safe. These layers of responsibility connect them at a deep level in a reciprocal relationship. The relationship has been strained in recent centuries with the many injustices to Native peoples and their lands since European colonialism. But she and others have been working hard on a Seed Rematriation project—named in honor of the women who often saved tribal seeds—to bring some of the traditional seeds currently stored in vaults and universities back to the tribes that first cultivated them. At the workshop, she said she prefers to use the phrase “seed stewardship” rather than “seed saving” because it carries the concept of relationship with it. It’s a message that needs to be heard beyond Indian Country, too. Those of us trained in the western sciences have been admonished not to “anthropomorphize” the subjects and environments we study by thinking of them with affection, or as anything with characteristics supposedly limited to humans. And forget about considering land sacred. An effort to be objective guides that stern so-called scientific approach. It can be an admirable goal in many cases—but as practiced, it could well be one of the reasons we find a smaller proportion of the Native population interested in pursuing science than among the population as a whole. Science instructors at tribal colleges can help bridge that divide. For one thing, it’s important for us to remember that the metaphysical realm is outside of the purview of western science. By definition, western science can only speak to what can be tested physically. That’s something I remind my science students every semester. Too many western scientists try to claim that just because science can’t test spirituality in a controlled experiment, it doesn’t exist. Quite a few even imply that being a good scientist requires being an atheist. In reality, spirituality is outside the realm of western science to consider one way or the other. That’s not the same as saying it doesn’t exist. As the scientific saying goes, “Absence of evidence does not mean evidence of absence.” Basically, there’s nothing in the scientific method that can refute a metaphysical reality. That’s something that we science instructors at tribal colleges can make a conscious effort to share with our students. For example, when I teach the students in an agriculture class about the taxonomic plant families identified by western scientists, I also assign a reading on “The Three Sisters” from a 2013 book of essays by Robin Wall Kimmerer, a decorated professor at the State University of New York who is also a member of the Citizen Potawatomi Nation. It’s interesting that even western taxonomy acknowledges kinship among beings by placing related species into families. Further, as my TOCC colleague who specializes in genetics points out, scientists actually use genetic information to estimate the degree of relationship among various life forms, from bacteria through plants through animals and including humans. That’s a clear acknowledgement of the truism in the phrase “all our relations,” at least when it comes to those deemed life forms. In the end, whether we’re hearing it from western geneticists or Native botanists, it’s all relative. 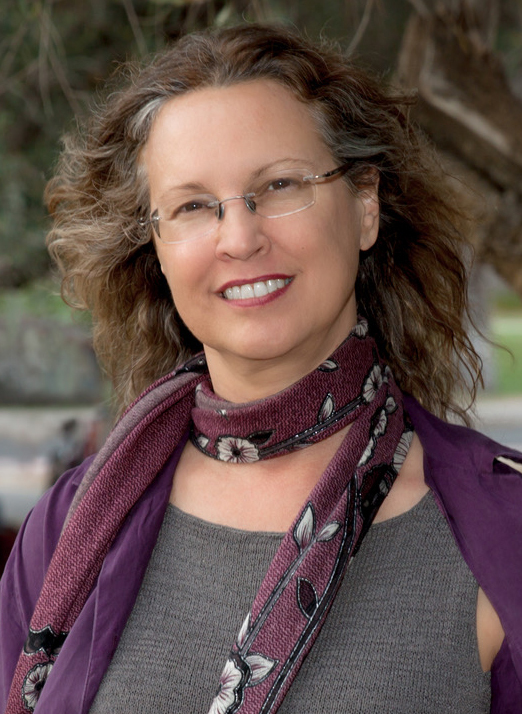 Melanie Lenart, Ph.D., is a scientist and writer who spent more than a decade of her postdoctoral career with the University of Arizona before joining the faculty as a science and agriculture instructor at Tohono O’odham Community College in 2015. She appreciates the opportunity to learn more about indigenous thinking as she works with the Tohono O’odham, who retain some of their ancestral land in the Arizona desert on a reservation nearly the size of Connecticut. She will be sharing her views on the overlap of western science and Native science in an occasional series in Native Science Report. These are the personal opinions of the author and do not reflect the views of Tohono O’odham Community College.